Best Free Android Alternative Camera Replacement and Photography Apps for Download: 17 Droid apps compared! REVIEW PLATFORM: Motorola Droid (running Android 2.3) now rooted and overclocked! The Android Marketplace is full of camera apps that replace / improve your existing camera app. Are any of them worth your download? You will find out here! First, let's check what the built-in Camera app does have: geo-tag, limited effects, auto-focus, auto-flash. Let's use that as a baseline, say 5 out of 10. Now let us look at the competition. Pro Paint Camera is a pretty standard camera app, but the trick it has up its sleeve is the ability to manipulate the image AFTER it was taken. In other words, it's a paint program, tacked on to the standard camera program. The AutoFocus and AutoFlash buttons are moved onscreen instead of hidden in a menu choice like the regular Camera app, but the two buttons, along with Gallery and CamCorder buttons, took up quite a bit of the right side of the screen, making the preview window smaller than it should be. The resolution choice is also somewhat limited. I see only two choices on my Droid. Once you took the picture, you can click on "edit", and you get a pen tool where you can make annotations, free-hand draw (just use your finger), and so on. While it's not Photoshop, it is very useful in making some arrows or circles to call attention to something you want people to notice in the picture. It also has many special effects such as x-ray, saturate, light burst, and many others. You can also use the program strictly as a paint package. If you want MORE abilities, you can pay for the Pro Paint Camera 5X. As a camera app, Pro Paint Camera is merely average. However, its ability to integrate paint / annotation, while keeping connection with Camcorder and gallery makes it a keeper, IMHO. FxCamera is more of a gimmick, because it applies special filters (not in the standard effects) to the camera, simulating some special effects, such as "toy camera", "Polaroid (tm)", "Andy Warhol (tm)", Symmetric Cam, and so on. Otherwise, it is a standard camera. It is fun to explore its effects, but it is more for amusement than serious work, IMHO. 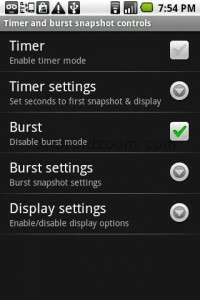 Camera Magic attempts to give you a bit more capability with your camera by adding timed mode and burst mode. However, the burst mode is a bit of a misnomer. The Android phones, even the Motorola Droid, are limited to the speed it saves to the SD card, and thus, in reality, the "burst mode" is more like 1 shot-every-X-seconds mode. In my experience, the X turns out to be about 8, as in one shot every 8 seconds.Your results may vary, but I doubt you'll even get close to 1 shot every two seconds. The timed mode, well, not that useful since there is no tripod or steady-cam, and no indicator to help you stay in frame. Camera Illusion is a relatively new kid on the block, but it packs features. However, it has a few drawbacks too. First, the max resolution is limited in the free version, to the screen res, which for the Droid is 848x480. You can actually go LOWER if you need more speed, all the way down to 176x144. However, it does NOT do full resolution. It however, comes with some very impressive filters, such as ASCII. Yes, ASCII art. Take a picture and it is rendered with ASCII characters. There are also tons of other filters. Many are available in other Camera apps, but the fun part is there's a "random" button you can try if you don't know what effects to try. The main problem with this app is lack of "full resolution". 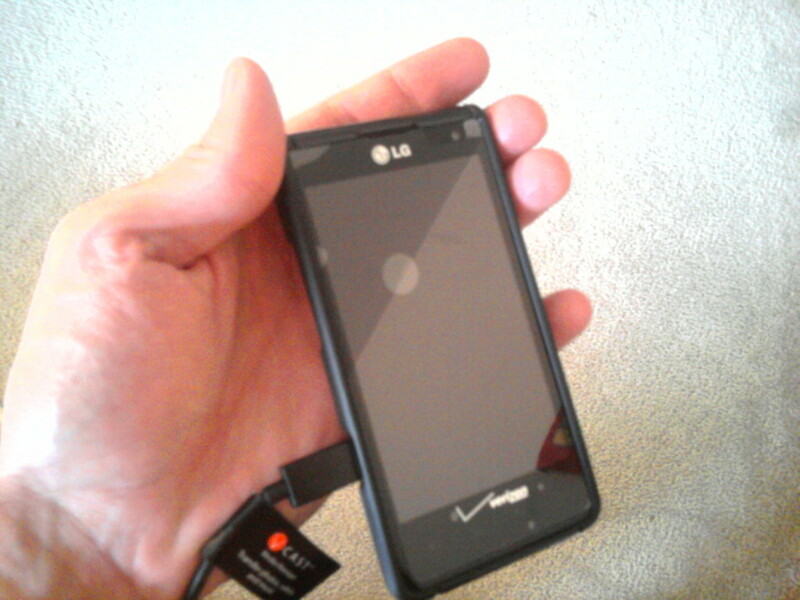 The Droid has a 5 megapixel camera, but this free camera app does not even use 1/5 of the resolution. It's fine for MMS photos, and web postings, but not good enough for printing. NOTE: Pro version available with higher res capabilities. Camera 360 was just released in both a free and a paid version, and even the free version blows every one of the existing camera apps out of the water. Camera 360's main claim to fame is image stabilization. Yes, this software camera has anti-blur. It seems to take care of the normal hand-shakes. I can't quite testify to how effective it is, but it is certainly the first software cam on the Android to claim such a feature. UPDATE: The image stabilization feature was moved to the "pro" version in the recent updates. UPDATE2: They added it back to the free version. The program also offers "full manual" modes. Most camera app just let you use auto focus. In Camera 360, you can do no focus, auto focus, pre-focus, and manual focus. In fact, you can even choose among normal, infinite (nature), or macro modes when it comes to auto focus. There is even software zoom, where you can choose to "zoom in" to parts of the picture at cost of detail. Then there's the standard light compensation and white balance filters like fluorescent, night, and so on. You can also set delay self-timer, up to a MINUTE after pressing the trigger. Just as a standard camera, this app is already above and beyond any other camera apps. And we haven't talked about the special filters, scenes, and other capabilities yet. If you want to overlay a composition grid such as the old "golden ratio" or the newer "square root" grid, you can do that as well. Use that to help you compose your shot, or use as a simple viewfinder / center finder. If you want filters, there are plenty as well. 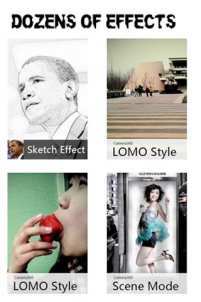 All of the standard filters are there, such as color tint, mono, sepia, sketch, and so on. But this also adds "simulated HDR" (2 versions), LOMO, and a few others. And we are NOT done yet! Camera 360 also lets you play pseudo-bluescreen, and poses you in exotic locations with other famous subjects or comical fantasy settings. among other possibilities. 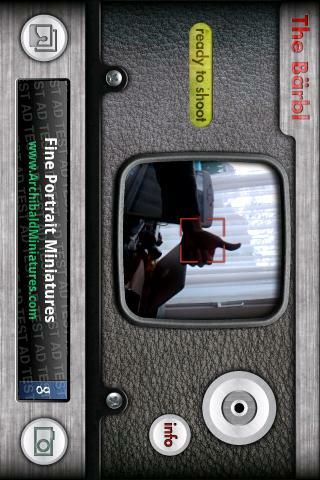 You can even make "pseudo-miniatures" using the tilt-cam mode. It also has a "ghost mode" where you add ghostly apparitions to your photos. 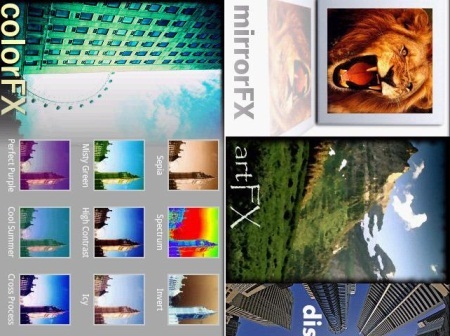 Pros: full suite of effects, overlays, compositing, etc. 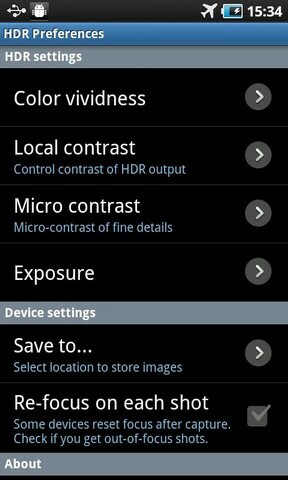 Vignette is also very new but it is very full-featured as well, almost matching Camera 360 feature for feature. It also adds a lot of artistic frames, but lacks the "greenscreen" composite modes and ghost modes of Camera 360. The biggest problem with the demo version of Vignette is it does NOT support full resolution photo. The demo version is limited to roughly 1 megapixel picture. That is not a lot, when the Droid has a 5 megapixel camera. To its credit... it does not have both intro and outro nag screens like Camera 360. The onscreen menu seem to be a bit more intuitive than Camera 360's, but functionally is about the same. Overall, this is a good alternative to Camera 360, but the free version, due to lack of resolution must be rated a bit lower. Verdict: Good, if you pay for it. This app does HDR (high dynamic range) photography by merging 3 separate pictures taken with different exposure compensation together to get one picture that gives you detail of black areas as well as bright areas. In practice, the effects are a bit subtle to tell, you you need a location that can actually have a huge brightness range from light to dark to truly test it. I found it to be... usable. It doesn't make dark areas completely come to light, but it does improve it somewhat over a normal picture taken at the same location. As 3 pictures are taken you do need a stabilized camera (holder, tripod, or very steady hand). Worth a try, since this is free. Plus version available. Retro Camera is another gimmick by simulating various "older" cameras, like a pin-hole camera, simulation a Polaroid, and so on. It simulates different menu buttons and such, and it even has a history for each camera. However, it really is more of a "fun" instead of "functional" camera app. They are basically special effects cameras, and it is very similar to FxCamera, in a sense, but more "camera-centric" effects. Droidget Camera, from Japan, is a weird duck indeed. Stock, it is basically just like the stock camera app. However, the power of the camera is EXTENSIBLE by downloading "widgets" (actually they are more like plug-ins), and there are already over a dozen different widgets for various capabilities. Performance is okay, not quite as comprehensive as Camera 360, but it definitely works. The camera is a bit buggy, as I did hit a couple Force Close errors, but that may be due to the widgets, not the camera app itself. Definitely worth a try, esp. since it's FREE! However, it does seem to take up a LOT of space in the memory. Beware! Sleek Camera aims to be a universal camera app that is just small, fast, and works. It has all the basic features, but nothing really advanced to set it apart. It is a basic camera app. The interface is clean and onscreen buttons are nice and big. However, reading the comments seem to indicate some problems on the newer phones, such as some of the Samsung Galaxy S phones and the Sony Xperia X10. As it is free, give it a try. Fast Burst Camera Lite claims to do 5-10 shots per second. by lowering the resolution a bit. However, in practice, it usually chokes at about 3-4 frames, then a LONG pause while it flushes the buffer. Then it becomes maybe 1 frame per second. Your results may vary, as I merely have a Moto Droid. The free version lacks a lot of features. No zoom, no flash, not even special focus. If you want "action" shots I recommend ActionSnap. 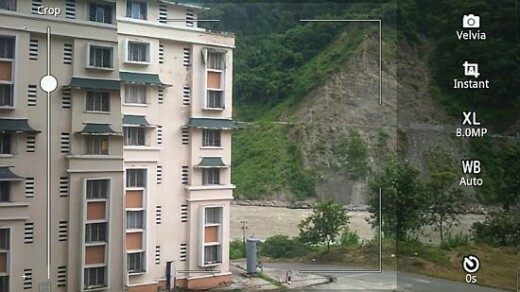 Camera Advance is an improvement of the original camera, with some experimental features. Overall, it is interesting, but the experimental features are quite buggy. The UI is pretty simple, a set of "icons" in a ribbon on the left. If you click on an icon (no labels) a second ribbon of icons popped up to choose specific functions. For example, for flash, you get on, off, auto, light mode (stay on). The problem is the icons chosen are not THAT obvious, and really needs a button that adds labels to the buttons. The camera app have a few tricks, such as the experimental panorama mode, but the comments were not too kind, as it seems to crash on quite a few phones. And the timer doesn't always work, or crashes. 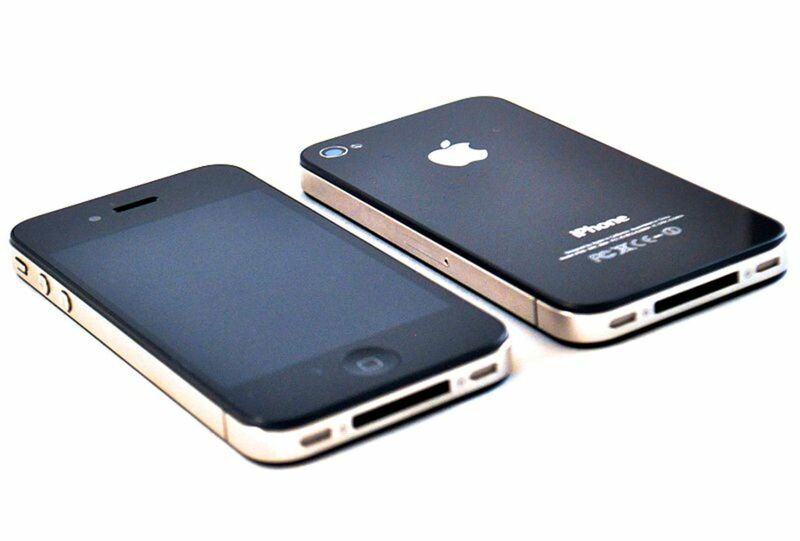 The lite version is limited to 2 megapixels resolution max. The full version will use whatever your camera's got. 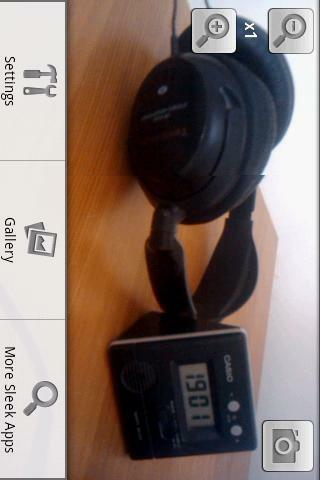 All in all, Camera Advance Lite is a bit limited in what it provides, a bit unstable, and the UI needs a bit more work. Action Snap takes four pictures in rapid succession so you can get a sense of the action. You can have it arrange it in 4 vertical slices, or in 4 "quadrants". You can also use it as a normal camera. In practice the four shots are all made within 2 seconds (more like 1.5 seconds), so it does capture the rapid actions. And this is a unique feature.The only filters are LOMO and B&W. Camera Fun Free doesn't claim to be a fancy camera at all, but just a camera with some funky effects. The problem is the free version only has 2 effects (I can't count sepia as it's in the standard camera app). Its main trick is that it will do "live previews". In other words, you see the effects you chose directly on screen, instead of only see the effects AFTER the photo's taken. The full version has over a dozen effects, but they count the ones in the standard camera app also. This app is cute, but it's not that functional. Little Photo is an app that either takes camera input or an existing picture and apply variety of effects on it. There are even some interactive effects, such as emulated bokeh (foreground superclear, background blurry). The effects can be stacked. The only complaint is the output size seem to be rather limited instead of the original picture resolution. Strictly speaking this is not a camera app, but more of a picture editor/effects app. 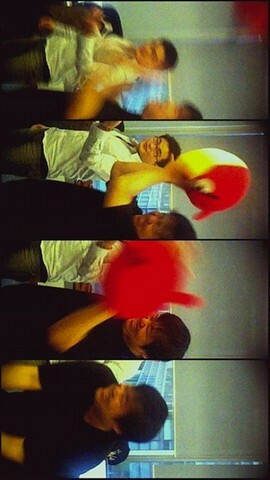 Other than integration with a Korean service called CyWorld, CyCamera appears to be a pretty ordinary camera app. Pudding Camera is mostly in Korean, and it's integrated with the Korean online service "Pudding". As I don't read Korean, I have no idea what's so special about this camera app other than the integration. Camera 360 is the only "camera app" you'll need, period. The free version is plenty powerful. Vignette (demo) is a good 2nd place alternative, esp. if you don't need full resolution pictures. 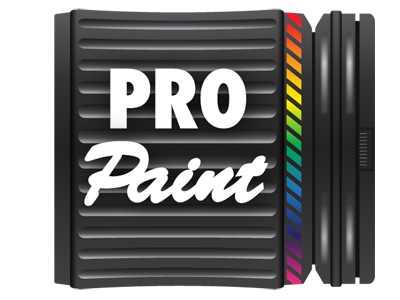 Pro Paint Camera is for those of you who actually needs a paint program to "retouch" your photos. As a camera app it is not that good. If you need some "action photos" Action Snap is pretty good. Everything else are just gimmicks. 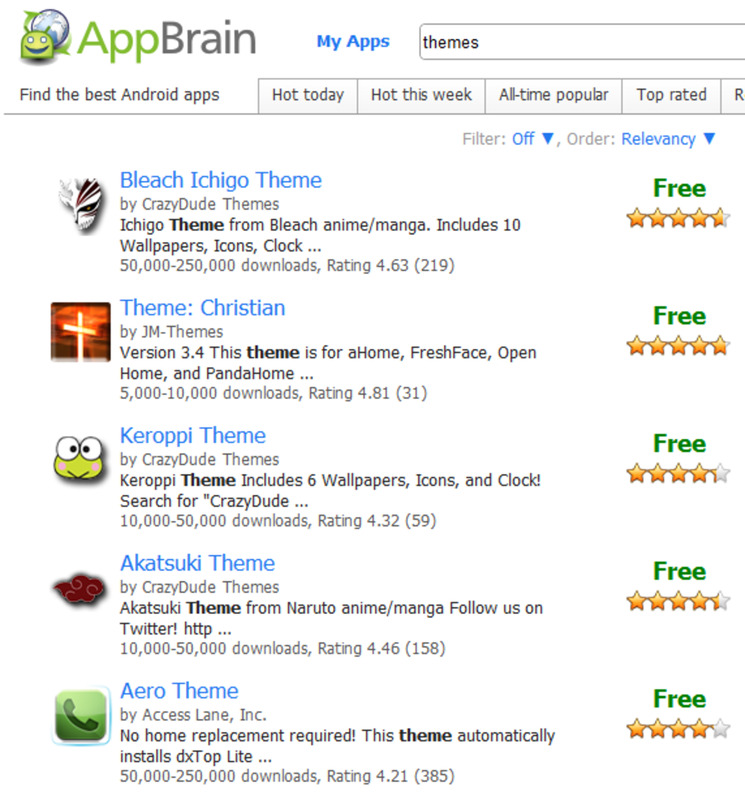 Review of over a dozen free home or launcher replacements for Android 2.X phones. Which replacement supports themes, live wallpapers, static shortcuts, pop-up shortcut bars, additional workspaces, previews, and/or other abilities? Find out here! Android phones can do a lot, but how about exercise buddy? Personal finance? Find 8 uses you haven't thought of with your Android smartphone. Your Motorola Droid (or other Android devices) probably do not have AVI file player. So which AVI playback app should you download? Review of YxFlash, RockPlayer, and ArcMedia are here. Which is the best AVI player on Android? Learn how video on Motorola Droid (and most Android phones) is limited, and how to convert videos on your desktop for use on your Android device with a free converter, and how to get it into your Droid. 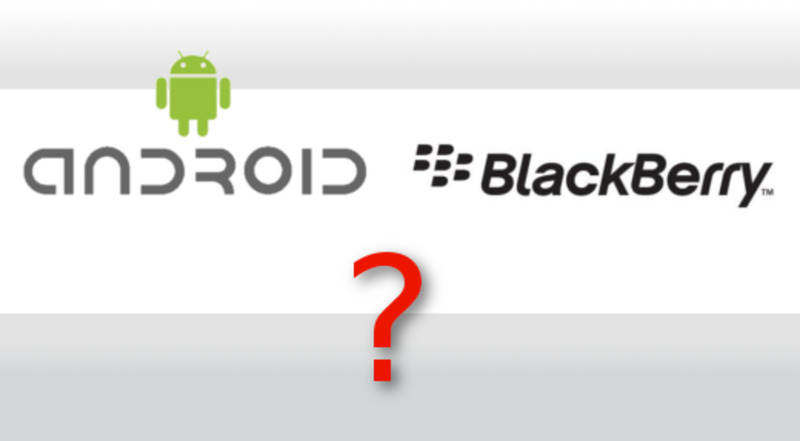 Android OS has multi-tasking, yet switching among programs are a problem. So what programs are available to help you switch tasks and launch programs? Read this! I never though we have this awesome apps in android phone :) I remember those times that I used android phone, I am using the camera 360 but I never know how to used those filters. But there's a couple Picasa apps, and didn't Yahoo just launch a new version of that thing? Pudding camera is actually not bad. You only have to understand a few korean words. @Alex Perelman -- I hate to say this, but you really need to get a real camcorder. The microphone on a smartphone is simply pointed in the WRONG DIRECTION to pick up good sound to make a decent video, no matter what you do to massage the signal. If you need that much control over sound, you really should go for an external mic, or "post-production" the sound (i.e. send it to PC, edit the sound) This is a design deficiency that phone makers have yet to address. I use LG Optimus Mobile for which Multi Camer App and Quick Pic android camera apps works really well and they helps me to satisfy all me photography requirements. @Fadi -- it's not exactly manual focus, but more like "hold focus". You tell it to focus on one thing, then hold that focus so you can point the camera at something else. It's next best thing to manual focus. Camera 360 does not have manual focus.. I couldn't find it. If you really found it on the app can you plz tell me how? @kel - Almost all camera apps have a "delay timer". I know for sure Vignette and Camera 360 have it. I'll have to check if the built-in one have it. It's hard to take self pictures on Droid Pro, is there a camera app for delayed time? @derck -- es possible que escribes en ingles, por favor? @everybody else -- derck is writing in Spansih. He is looking for an app for his SonyEricsson Xperia X10 Mini Pro (the new one) that can allow recording Camcorder mode, but with live zoom (zoom while filming), preferably in nice smooth steps like a real camcorder. He also says some of the photos are corrupted. Hmmm... I don't know. Camcorder functions are not worked on much. I haven't seen many camcorder alternatives. As for the photo corruption, I'd check the SD card. Se me olvido mencionar que la camara de mi sony erickson x10 mini pro tiene un bug del porte de un buque. Problema: aleatoriamente algunas de las fotos (30% aprox.) las divide en rectangulos y las partes las desordena cual puzzle o rompecabezas, o lo otro es que las parte en 2, y una de las 2 partes queda bien y la otra queda desenfocada y con problemas de luz. Me encanta el mini pro, pero el software y la camara en particular es como el PICO (malo, fallado, pobre, asqueroso, etc)....igual que el soporte. 3.- que al seleccionar video, este empiece a grabar inmediatamente, y al pararlo quede listo para sacar foto o para seguir grabando. No que haya que cambiar de modo camara a video o viceversa previo a hacer la toma deseada. A ver si algún desarrollador atina. ActionSnap added. next is M Camera. Coming soon: review of Droidget Camera... This Japanese program uses a "plug-in" approach to features. I didn't know Camera Illusion was available. It's tough trying to locate apps on the Android market. I've also done a detailed review of what's in the Camera 360 app [ http://www.studioaside.com/blog/2010/08/camera-360... ] - which just proves your point that Camera 360 is the only photo app you'll need. Although I do, sometimes also use FxCamera. @Chris -- you should be able to find developer's e-mail address in the Android market listed with the app, but let me answer what I can. 1) the pic *does* go to the album (or gallery), but it takes a little while for it to be written. Give it a few minutes, or exit out of the program to force it to flush the cache to the gallery. 2) first, download the templates. 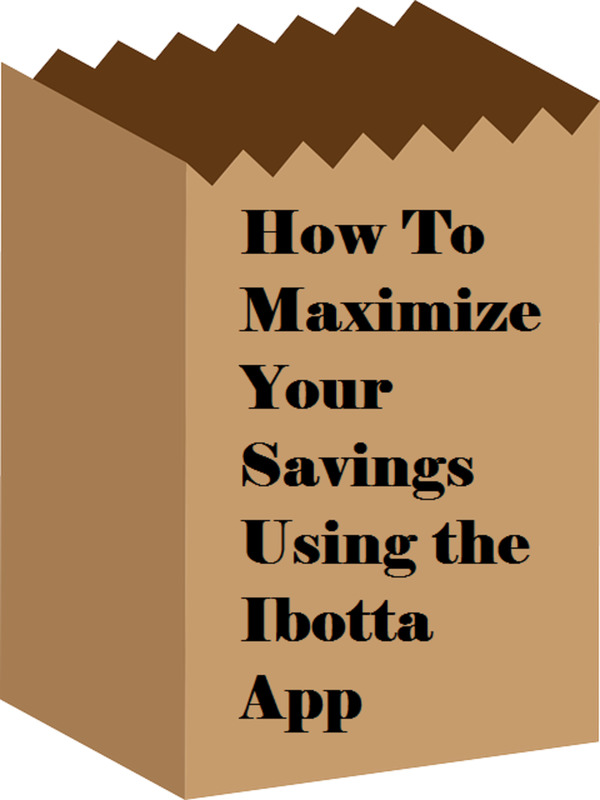 Once you downloaded them, run them to install them into the program. (Once they are installed, you can uninstall them from manage application function under settings / applications). Finally, start up Camera 360 and click on the "mode" button to switch to one of the other modes, like ghost mode, fun mode, and so on depending on which templates you "installed". You should see the new templates for selection. Love my Droid and was not aware of these. Thanks for the info! 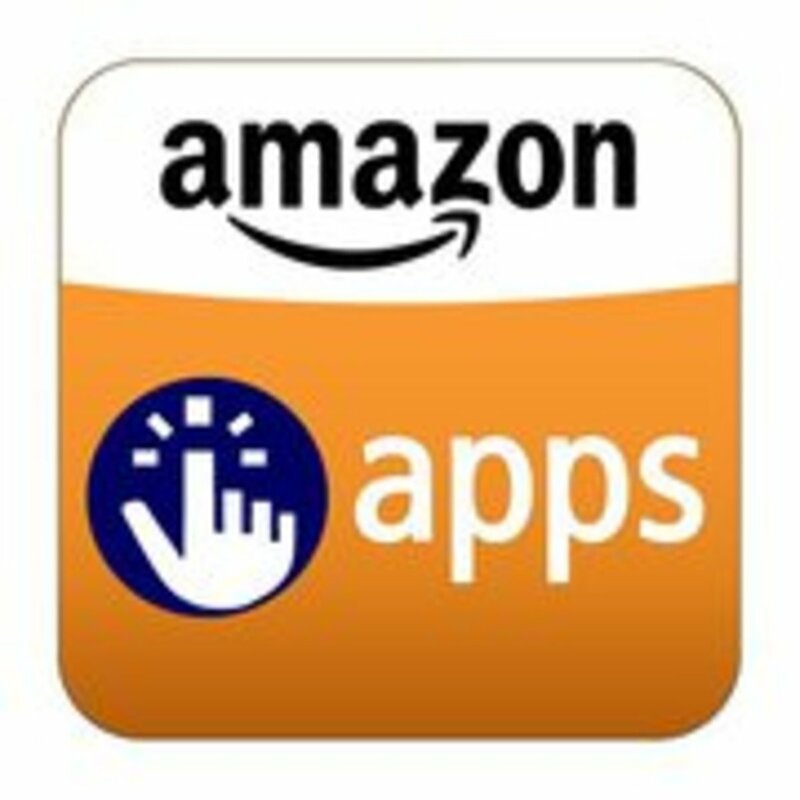 Nice review of application shown in the hub. It is the first hub which i have seen who has reviewed camera applications for Mobiles running Android 2.1. I am very much impressed by the "Pro Paint Camera" application as it allows you to annotate photographs quickly and easily.